90 Commonwealth is located on the SE corner of Commonwealth and Clarendon, with 86 Commonwealth to the east, the First Baptist Church to the west, across Clarendon, 65 Commonwealth to the north, across Commonwealth, and 233 Clarendon to the south, across Alley 436. 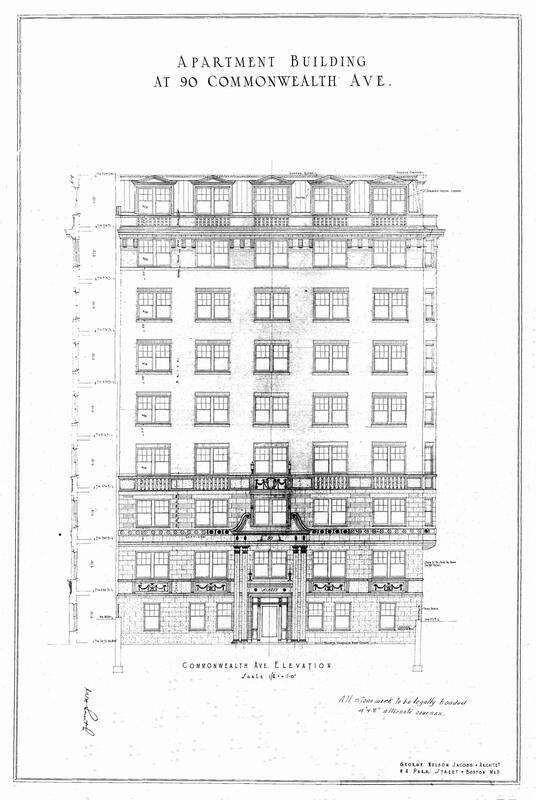 90 Commonwealth was designed by Edward B. Stratton and George Nelson Jacobs, architects, and built in 1925 as a nine-story, 24-unit apartment house by building contractor Frederick J. Van Etten, who also was the owner. 90 Commonwealth replaced two townhouses at 88 Commonwealth and 90 Commonwealth. Both houses had been acquired by Michael Seretto, a contractor builder, 88 Commonwealth on March 13, 1923, and 90 Commonwealth on August 6, 1923. Click here for an index to the deeds for 90 Commonwealth. 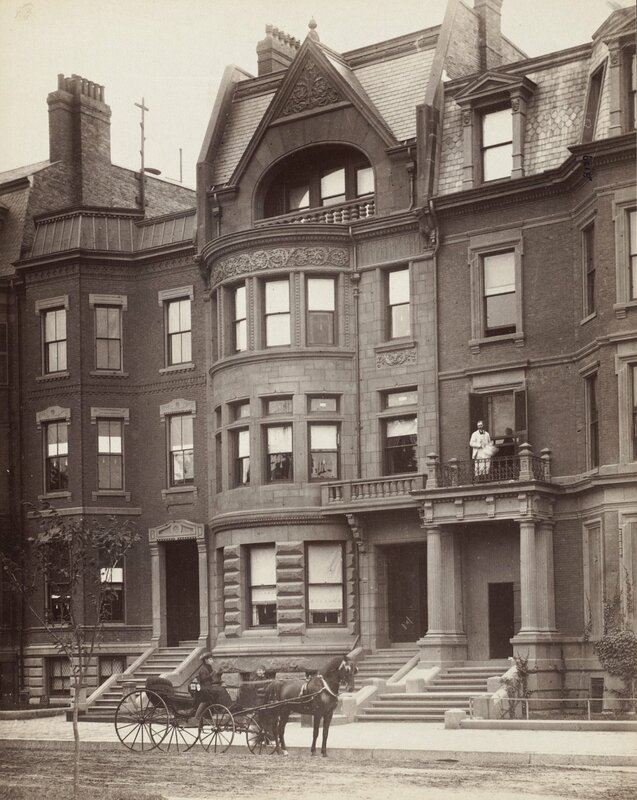 On October 15, 1923, Michael Seretto transferred the two properties to Ninety Commonwealth Avenue, Inc., of which he was the president. The same day, the company arranged for financing the new building through bonds to be issued by S. W. Straus & Co. of New York and a mortgage to the First Peoples Trust. On January 18, 1924, Michael Seretto filed a permit application for the building, indicating that it would be designed by architect Charles R. Greco. The permit subsequently was approved by the Board of Appeal on March 5, 1924. Michael Seretto died in April of 1924. On July 23, 1924, Herbert S. Riley foreclosed on the mortgage from First Peoples Trust, which it had assigned to him, and transferred the property to George F. Garrity, Jr. On April 11, 1925, George Garrity transferred the property to real estate dealer and conveyancer William J. Stober, who entered into a new mortgage with First Peoples Trust and conveyed the property (with the mortgage) to Norma F. (Allen) Van Etten, the wife of building contractor Frederick J. Van Etten. In July of 1925, the F. J. Van Etten Company filed for (and subsequently received) permission to construct the building, with Edward Stratton and George Nelson Jacobs, as the architects. Plans for the building — including elevations, floor plans, framing plans, and foundation plans — are included in the City of Boston Blueprints Collection in the Boston Public Library’s Arts Department (reference BIN N-9). On January 22, 1927, the First Peoples Trust once again foreclosed on their mortgage and transferred 90 Commonweal to the Massland Realty Company. It continued to own the building for the next twenty years. 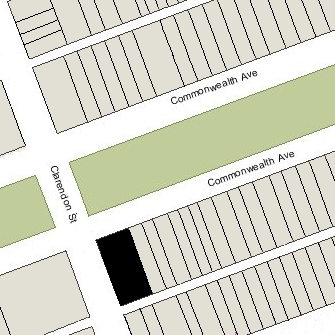 On November 21, 1947, 90 Commonwealth was acquired from the Massland Realty Company by 90 Commonwealth Avenue, Inc.
On February 1, 1955, 90 Commonwealth was acquired from 90 Commonwealth Avenue, Inc. by Katherine F. Ladd. She was a bookkeeper and later office manager for Dreyfus Properties, which managed the building and probably on whose behalf she owned the building. 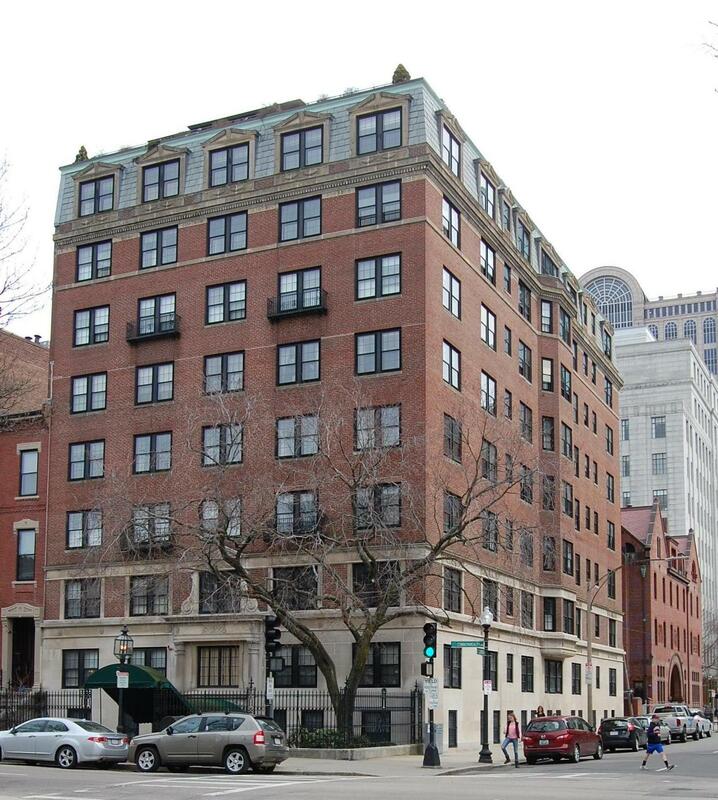 On June 23, 1973, 90 Commonwealth was acquired by Albert L. Manley and Leonard S. Green, trustees of the Ninety Commonwealth Avenue Condominium Trust. On July 9, 1974, it was acquired by Robert A. Keezer and Felix D. Paige, trustees of the 90 Comm. Associates Trust. 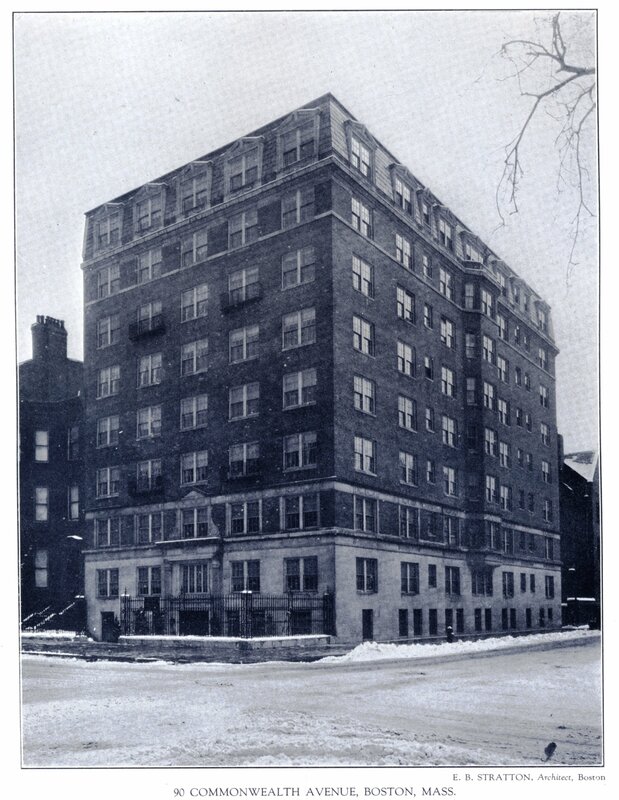 On August 22, 1974, they converted the building into 25 condominium units, the 90 Comm. Condominium. 88 Commonwealth was designed by architects Peabody and Stearns and built in 1881-1882 by Norcross Brothers, builders, as the home of Emma Frances (Pierce) Keyes, the widow of merchant and railroad investor Henry Keyes, and the mother of Henry Wilder Keyes, who served as Governor and US Senator in New Hampshire. Her unmarried daughter, Isabella F. Keyes, lived with her. Plans for house are included in the Peabody and Stearns Collection in the Boston Public Library’s Arts Department (reference PS/MA.089). The plans refer to a September 10, 1881, contract, with the firms and individuals who built the house. 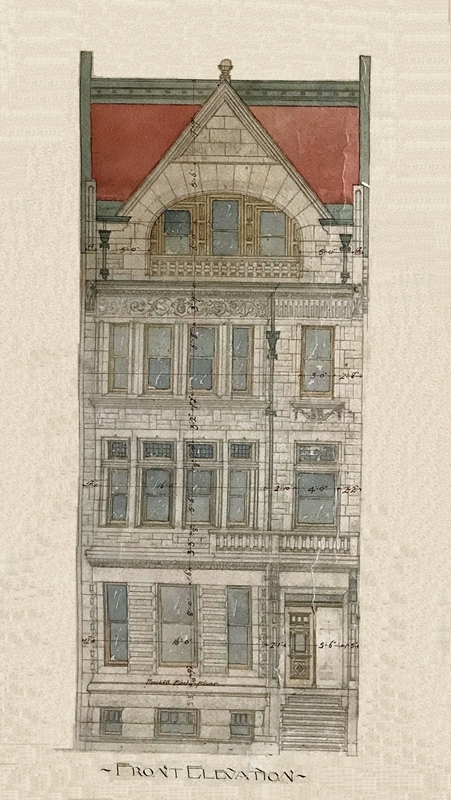 Click here to view the original plans for 88 Commonwealth (Demolished). Emma Keyes purchased the land for 88 Commonwealth on March 21, 1881, from Edwin Tufts. He had purchased it on November 4, 1879, from future US Senator Henry Cabot Lodge, who had also owned the lot to the west, where 90 Commonwealth would be built. Both lots were originally purchased on July 6, 1865, from the Commonwealth of Massachusetts by William Sumner Appleton. Click here for an index to the deeds for 88 Commonwealth (Demolished). In about 1896, Emma and Isabella Keyes were joined by Emma Keyes’s widowed son-in-law, Ezra Henry Baker, and his infant daughter, Gertrude Baker, who moved there soon after the death of his wife, Martha (Keyes) Baker, in June of 1896. They previously had lived at 294 Marlborough. Ezra Henry Baker was an investment banker. He was the first chairman of the Boston Licensing Board, serving from 1906 to 1912, and later was treasurer of Radcliffe College. Emma Keyes died in 1916 and Isabella Keyes died in February of 1920. Ezra Baker and his daughter, Gertrude, moved soon thereafter to 6 Gloucester. On March 13, 1923, 88 Commonwealth was purchased from they Keyes family by building contractor Michael Seretto. In October of 1923, the Swift-McNutt Company received permission to demolish the house. 90 Commonwealth was built ca. 1879 as the home of merchant Nathaniel Walker and his wife, Susan White Seaver (Grant) Walker. They previously had lived at 87 Pinckney. Nathaniel Walker purchased the land for 90 Commonwealth on April 28, 1879. from future US Senator Henry Cabot Lodge, who also owned the lot to the east, where 88 Commonwealth would be built. Both lots were originally purchased on July 6, 1865, from the Commonwealth of Massachusetts by William Sumner Appleton. Click here for an index to the deeds for 90 Commonwealth (Demolished). Nathaniel Walker died in December of 1885. Susan Walker continued to live at 90 Commonwealth. Their son, Grant Walker, lived with her until his marriage in June of 1888 to Mabel Shaw. After their marriage, they moved to 386 Beacon. Susan Walker died in April of 1903. On August 11, 1903, 90 Commonwealth was purchased from the Nathaniel Walker estate by retail clothing merchant and banker Abraham Shuman. He and his wife, Hettie (Lang) Shuman, made it their home. They previously had lived at 60 Vernon in Roxbury. They also maintained a home in Beverly. Hettie Shuman died in June of 1904. 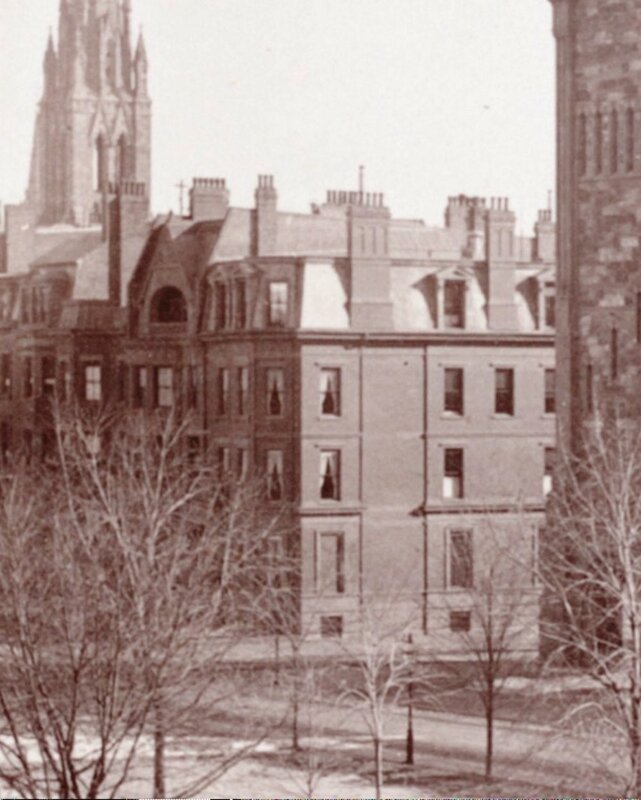 By the 1904-1905 winter season, Abraham Shuman had been joined at 90 Commonwealth by his son-in-law and daughter, Carl Dreyfus and Lillian (Shuman) Dreyfus. Carl Dreyfus was a shirt and clothing manufacturer. Lillian Dreyfus died in February of 1913, and Carl Dreyfus moved soon thereafter to 48 Beacon. At about the same time, Abraham Shuman’s daughter, Emma Weil, came to live with him. She was the widow of August Weil, a shirtwaist manufacturer in New York City. Abraham Shuman and Emma Weil continued to live at 90 Commonwealth until his death in June of 1918. On January 12, 1920, 90 Commonwealth was purchased from Abraham Shuman’s estate by George Hastings Swift, the New England representative of his father’s meat packing firm, Swift & Company. George Swift and his wife, Lucile Darst (Casey) Swift, lived at 148 Commonwealth and appear to have left 90 Commonwealth unoccupied after they acquired it. On August 5, 1920, George Swift transferred 90 Commonwealth into his wife’s name. On August 6, 1923, 90 Commonwealth was purchased from Lucile Swift by building contractor Michael Seretto. In October of 1923, the Swift-McNutt Company received permission to demolish the house.